*This article and brief commentary was intended for the blog of the class I co-teach, “exploring [cultural] diversity: implications for art education,” at Teachers College. I accidentally published it on My[MEDIA]tedLife, and although short posts are not my typical style (perhaps to the chagrin of some), I think I may start to intersperse more posts like this to document what I’m reading, thinking about, what I’m finding in the interwebs that I’ve deemed relevant to my life, my work, and my research. So stay tuned! 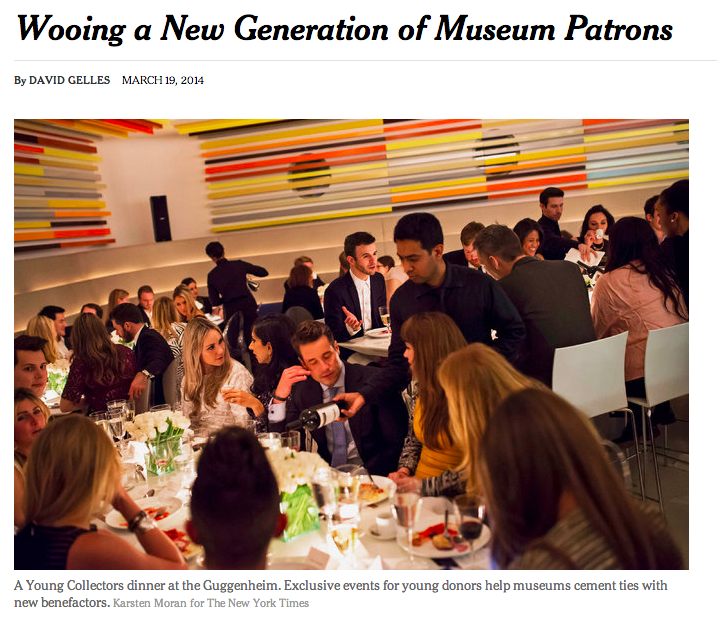 Article in the New York Times this morning…interesting to think about how the age of the Internet, commitments to different “social causes,” and the extreme speed at which life now moves may change how, when and where future young generations go to museums. Also incredibly important to consider which young people are being discussed/talked about in this article; who has the social, cultural and human capital that affords access to this realm of life/culture/society? Who are the “traditional” donors and how does legacy play a role in the power structures that continue to uphold so much of what might be labeled “high” culture (and what are the problems with this)? “The generational shift is something a lot of museums are talking about,” said Ford W. Bell, president of the American Alliance of Museums. “The traditional donors are either dying, stepping back or turning it over to their children or grandchildren”…Generational change is always occurring as new blood takes the place of the old. But as the boomers’ children take over, there is concern among administrators and trustees that millennials are not poised to meet the financial and leadership demands of increasingly complex — and expensive — museums…not only are 20- and 30-somethings today more interested in social causes like education, the environment and international aid than they are in the arts, but because of shifting demographics, there may simply be fewer wealthy young patrons to write checks. ← [Love] Letter III: Dear J.